Over the first week of November, I travelled to England with colleagues from Laurier to meet with alumni, the Dean's Advisory Council for the Lazaridis School of Business and Economics, and the first cohort of students enrolled in the Laurier and University of Sussex six-year Bachelor of Arts and Bachelor of Laws program. The University of Sussex in Brighton is just a 90-minute train ride from London. The campus sits in a valley filled with trees -- the leaves were bright with their fall colours while we visited, which added to the beauty of the campus. Interestingly, no building on campus is allowed to be higher than the height of the established trees! I'm pleased to report that the students from our Brantford and Waterloo campuses are thriving and happy with their courses at Sussex and all spoke highly of the preparation they received in their first two years at Laurier. This is proof of the good work that Laurier's faculty and staff have done in getting them ready to study and live abroad. We enjoyed presentations from the students, who spoke of their experiences settling into a new country, culture and campus. As the first cohort, these students are providing us with valuable insights that can be integrated into preparation workshops for the next cohort as we seek to continuously improve the program and supports for their transition to living and studying in England. 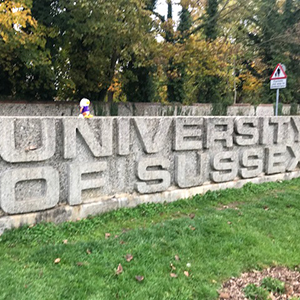 Perhaps the greatest highlight of this visit was hearing the students chant 'it's great to be a Laurier Golden Hawk' in the south of England. It certainly has a different resonance when you hear it so far from home and is a great reminder of the global impact of the Laurier spirit.